Do you have a Pain in the Neck...literally? We can help! Imagine balancing a 12 lb. (5.5 kg.) bowling ball on the tips of your fingers. All day long. That’s just one of many things your neck must do. Your neck and shoulders work hard. Even the smallest deviation in the relationships of the seven bones of your cervical spine (neck) can cause pain and reduced head and neck mobility. If the pain moves upwards, it can cause headaches. Moving downwards it can cause pain in your shoulders, spread into your back and even down into your arms causing numbing. Some tips to manage your neck pain at home: Use Ice--a good rule of thumb is 20 minutes off, 40 minutes on and then repeat. Check your pillow--if it’s too flat it will stretch your neck muscles unnaturally. Try neck exercises to loosen stiff muscles. Text neck, the onset of cervical spinal degeneration, happens when people are hunched over looking at their electronic devices, for hours at a time, which really puts an extreme load on the spine. A recent study published in the journal 'Surgical Technology International' shows that when you are standing or sitting straight your head weighs, 10 to 12 lbs. on average. But if you lean 15 degrees forward, the head weight is more like 27 lbs. With a 30-degree tilt, 40 lbs. And when you are hunched over at a 60-degree angle looking at a mobile device your head puts a 60 lbs. strain on your neck. Raise the phone . 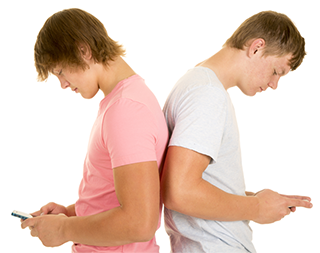 Move the cell phone (and other devices) to eye level so the head doesn’t have to be tilted. Take frequent breaks . Spend some time away from the phone—or any type of head-forward posture. Change positions when texting—lying on one's back is an excellent way to relieve pressure on the neck. Stand up straight . Good posture, with the shoulders pulled back, keeps the body aligned in a neutral position. Arch and stretch . Arch the neck and upper back backward periodically to ease muscle pain. Stay fit . A strong, flexible back and neck are more able to handle extra stress. We will also do physical and neurological exams. In the physical exam, we will observe your posture, range of motion, and physical condition, noting movement that causes pain. We will feel your spine, note its curvature and alignment, and feel for muscle spasm. A check of your shoulder area is also in order. During the neurological exam, we will test your reflexes, muscle strength, other nerve changes, and pain spread. If necessary, we will take x-rays or recommend a CAT, MRI or EMG scans. A neck adjustment (also known as cervical manipulation) is a precise procedure applied to the joints of the neck, usually by hand. A neck adjustment works to improve the mobility of the spine and to restore range of motion; it can also increase movement of the adjoining muscles. Patients typically notice an improved ability to turn and tilt the head, and a reduction of pain, soreness, and stiffness. In addition to manipulation, the treatment plan may include mobilization, massage or rehabilitative exercises, or something else. For a free evaluation and consultation to see how we can help relieve your neck pain. Chiropractic care is non-invasive, safe, gentle and a natural approach to neck pain treatment options.